Fourth Row Center: Film Writings by Jason Bailey: On DVD: "Thrilla in Manila"
A couple of days ago, I wrote a review of Monterey Pop in which I noted that, fair or not, it is simply impossible to view the film without comparing it to Woodstock; that’s just the barometer against which all 60s concert movies are measured. Similarly, anyone who makes a documentary about Muhammad Ali is going to have to understand that comparisons with the brilliant, Oscar-winning When We Were Kings are unavoidable—and, in the case of John Dower’s new doc Thrilla in Manila, slightly unfavorable. It is by no means a poor documentary, or a dull one. But it is (for most of its running time) much more of a traditional doc, conventionally structured and dutifully narrated by a Brit with crisp diction. What is notable and new is the picture’s point of view—a less-than-reverential view of Ali, who engaged in some rather ugly (and now mostly forgotten) race-baiting language in his public battles with opponent Joe Frazier. Those cries of “Uncle Tom” and “gorilla” are all the more shocking on investigation of the two men’s personal history—Frazier had supported Ali (both morally and, at times, financially) during his draft-fueled exile from the sport, and fought hard to arrange a bout when Ali returned to the ring. The history of their rivalry is well-told and, frankly, rather more sympathetic to Frazier, who is now something of a tragic figure, living in a room over his Philadelphia gym. His isn’t the only voice heard; several corner men, boxers, and friends of both men throw in their memories, though the most entertaining is Ali’s legendary doctor, Ferdie Pacheco. The chronology hopscotches between their back story and the run-up to their third face-off, the legendary 1975 titular bout. The fight itself is masterfully cut and, much like in When We Were Kings, genuine suspense is preserved for those who don’t know (or who have forgotten) the outcome. Director Dower beautifully intercuts fight footage, insights from the corner men and ringsiders, and extraordinary footage of Frazier watching the fight tape (reportedly for the first time). In that sequence, Thrilla in Manila overcomes the trappings of conventional nonfiction storytelling and becomes something altogether engrossing and memorable. 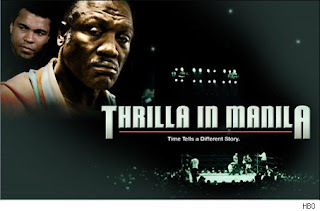 "Thrilla in Manila" is available now on DVD.